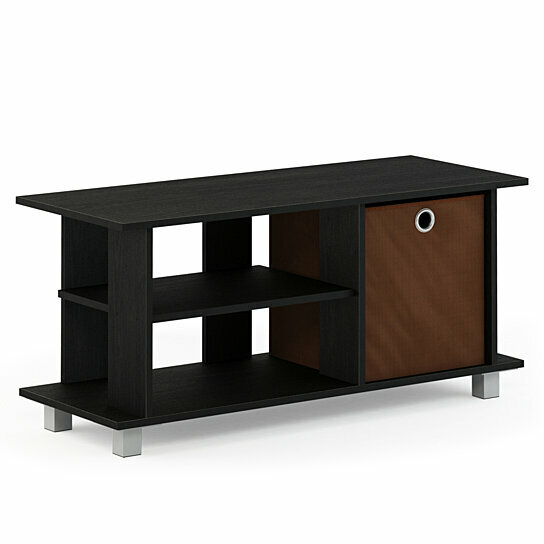 This Simplistic TV stands is petite and is designed to fit in your space, your style and fits on your budget. This TV stand comes with a foldable non-woven storage drawers. It is light weight and suitable to hide some light clusters like remote controls, gaming devices, DVDs, CDs and a few magazine. It holds up to 32-inches flat screen panel TV. Please refer to the dimension illustrated in the image before purchase. The main material is MDF and PU lamination. There are two shelves with open back that allow you to place some small audio video devices For care instruction, please wipe clean with clean clothes and avoid harsh or abrasive chemicals. Extra bins are available for sale if needed. QUALITY MATERIAL: high quality medium density composite wood, plastic tubes and non-woven fabric.